The Elite Impression Single Tote is a perfect bag for a bowler who wants a little more in their bag. This bag has an accessory pouch for rosin bags, cleaners, or towels as well as a shoe compartment for men's size 13 shoes. Also what a great warranty in a tote bag, one year is perfect! This bag is a must-have for any bowler who loves looking fresh on the lanes! The photos for this bag seem to indicate that there is a separate top compartment for shoe storage. There is not. I have yet to figure out exactly how the shoes are meant to be stored with just a flap and one small elastic strap. Otherwise OK.
Great starter bag if you are looking for something to hold ball, shoes, and some accessories. Bag started to break down after about a year of weekly use. There may be better alternatives in the same price range. 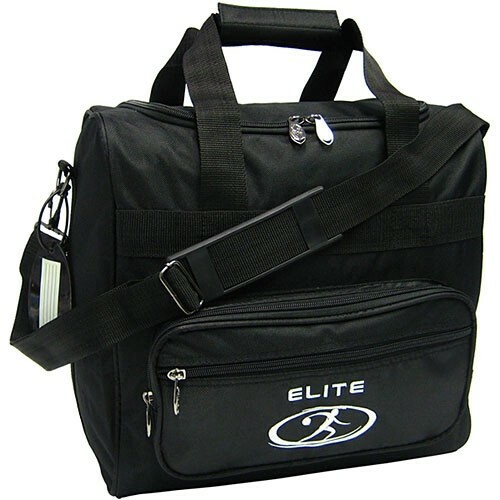 Due to the time it takes to produce the Elite Impression Single Tote Black ball it will ship in immediately. We cannot ship this ball outside the United States.